This is one of a series of posts about my recent round-the-world trip, all labelled #rtw2012. You may wish to start at the beginning to get the full context and background. Before starting my trip, I thought I’d go completely offline. And for the most part, I did. I turned off email sync’ing on my iPhone and iPad, except for a new emergency account I only shared with my immediate family. I didn’t read Twitter or RSS feeds, didn’t really monitor Facebook (although I did get the occasional message about something important). But my mom made it clear she would have trouble sleeping at night if she didn’t know I was alive, at least. I wanted to find an easy and fun (for me, at least) way to update her on my location, but without going into the above time sinks. 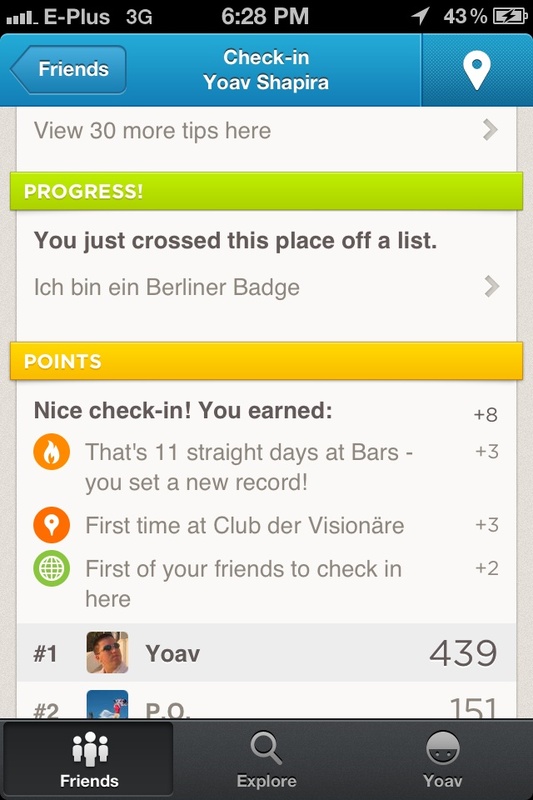 That’s why I resumed using Foursquare, after a couple of years away from the service. My Foursquare account is connected to my Twitter and Facebook accounts for publishing, so people could see where I was, but I didn’t have to manually login to the above, and I wasn’t tempted to catch up on news. Foursquare actually has ~3 types of checkins: private (visible only to me), unshared (Foursquare friends can see them, but they don’t get pushed to Twitter or Facebook, and shared (pushed to Twitter, Facebook, other connected apps, or combination thereof). One can control this for each checking, and set defaults. I use all 3 types, and probably only about 15-20% of my checkins are shared. Otherwise, things get noisy for my audience / followers (on any service). 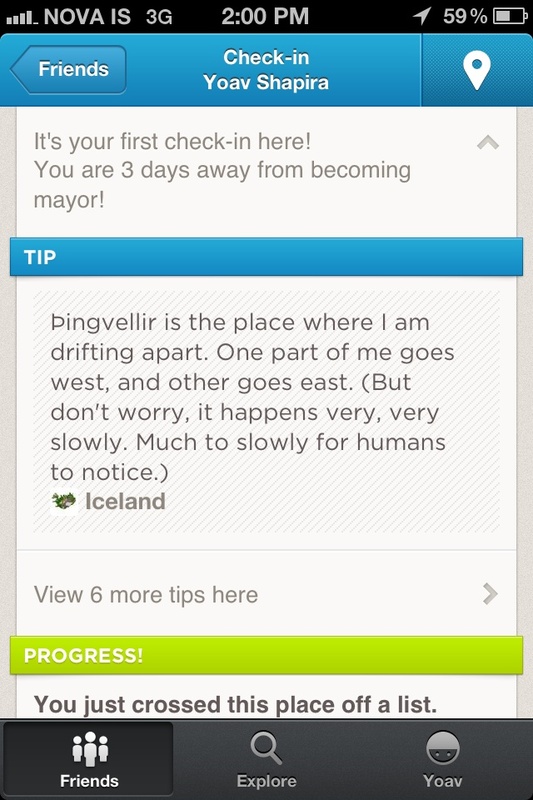 There are also some checkins I (or my company) would prefer not to publish, for various reasons. All 3 types are useful to help one collate a trip journal or diary, as I’ve done. I did have a couple of checkins that were supposed to be private accidentally get shared, primarily (but not exclusively) due to Foursquare changing their default sharing preferences with one of their app updates during the summer. Crossing an item off a list, this one for the Berlin city badge. 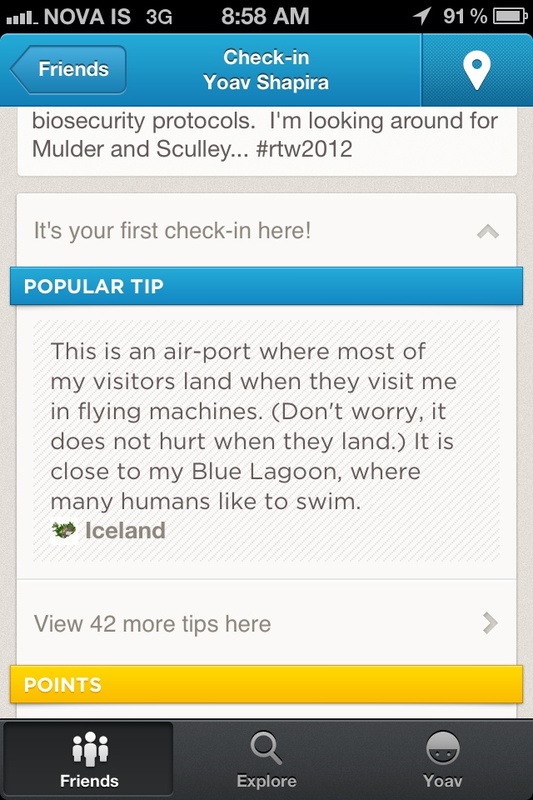 I make it a point to never tag anyone else in checkins, nor show faces (typically), unless people ask for it. Although I’m fairly public with my life, e.g. this blog, I don’t assume other people would be, so I err on the side of their privacy. 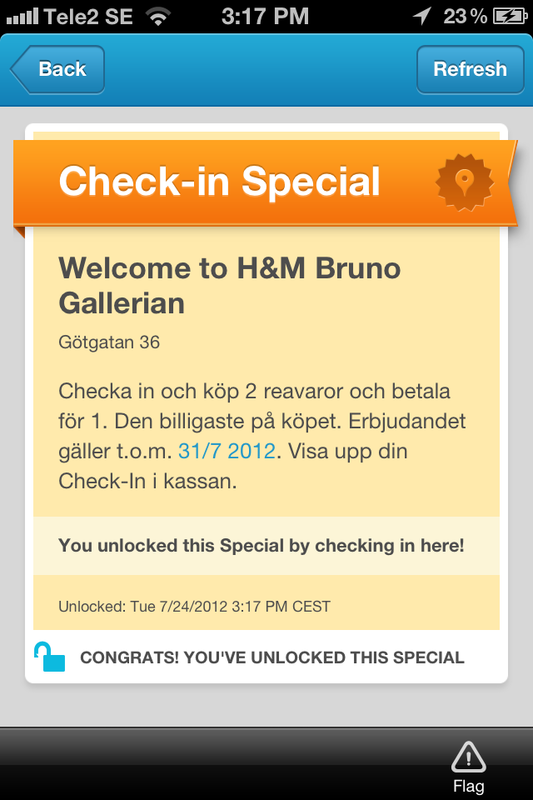 It was still strangely fun to get assorted Foursquare badges, but that is not news. 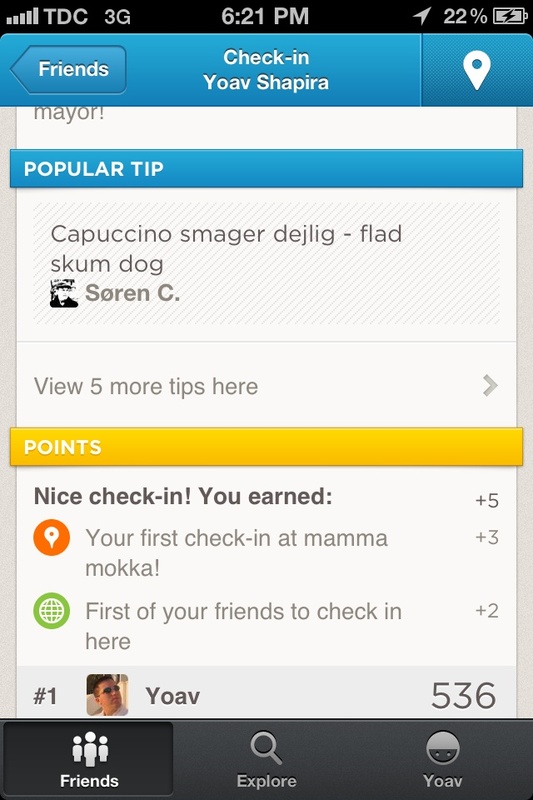 What was actually surprisingly much more useful than in 2010, the last time I used the service, were Foursquare lists. Both “official” (e.g. the ones from 4sqCities) and unofficial (from other users) list helped me with research, planning, and execution of the trip. A special in Stockholm, Sweden. The city-specific badges are a nice addition, and they have amusing texts, more so than most “normal” badges. Here are my city-specific badges from Tokyo, Bangkok, Istanbul, Vienna, Moscow, Berlin, and London. Many other cities I visited don’t have an official badge yet. I had a couple of “small world” moments, where I checked into a venue in a remote city / country I’d never been, only to find a friend had been there and left a valuable tip. This was especially fun when it happened in off-the-beaten-path, not mainstream, venues, like this record shop in Copenhagen. I texted my friend Maia (who put out this tip), and she enjoyed it as well, on Twitter. Tip from a friend in a random place in Copenhagen! It was nice to see some governments (e.g. 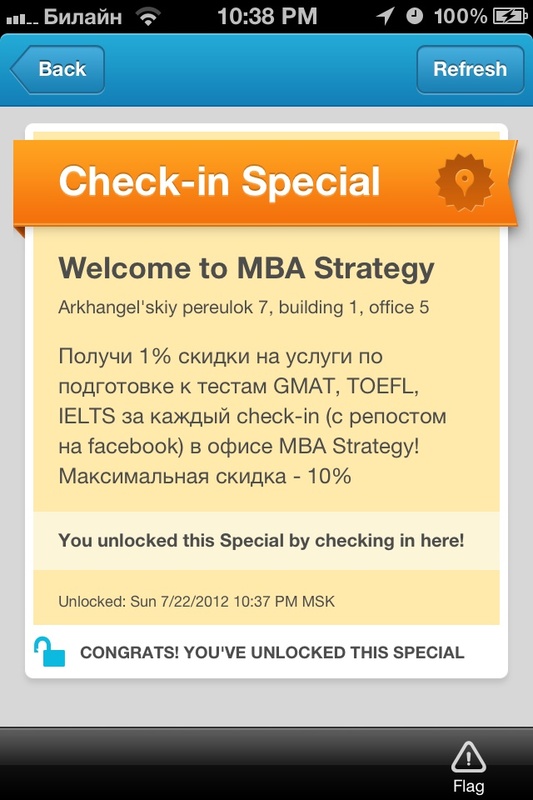 Iceland, see below screenshots) and companies (e.g. 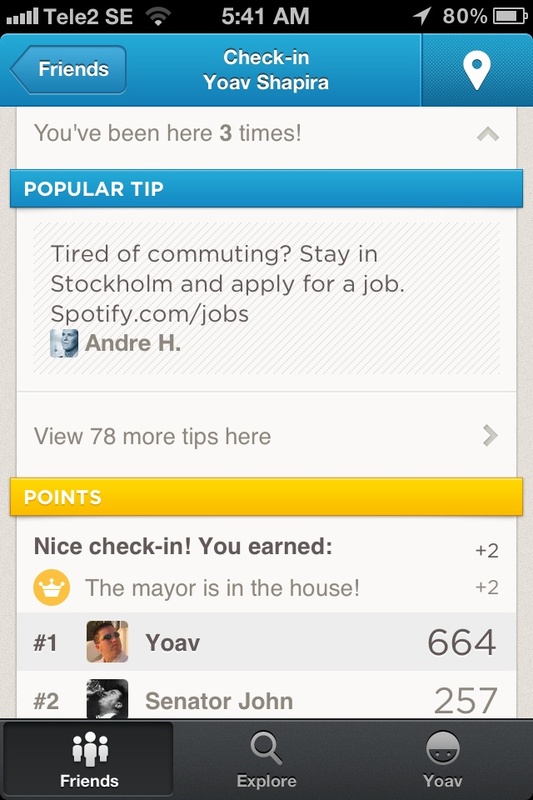 Spotify, also below) using Foursquare to help their causes (tourism and recruiting, respectively). Both used fun, fresh voices with personality — kudos to them. An important national park in Iceland. 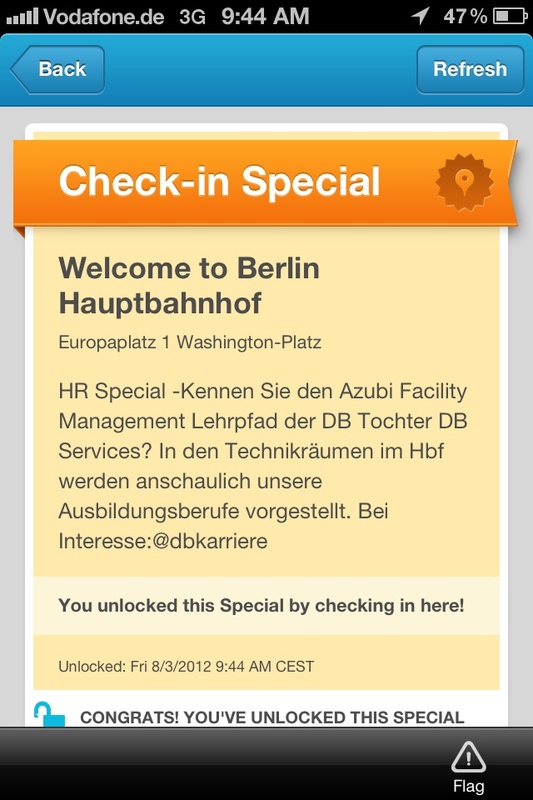 It was also interesting to see the internationalization (i18n) and localization (l10n) efforts Foursquare has put in since 2010, clearly visible when unlocking checkins, as you can see in a couple of examples below. I got my first 10x badge, a Trainspotter, the highest you can get on “expertise”-type badges, which was entertaining. The Foursquare leaderboard is still an obvious gaming element with little value or purpose. It’s too heavily stacked towards new places, and doesn’t reward repeat visitors enough. I not only led it during most of my trip, but I routinely had 4x-6x as many “points” as the nearest person, which is not cool, demoralizing, and destroys the gaming dynamic. I’m not sure why they keep this feature. Overall, I’m very happy with my usage of Foursquare. Will I keep using it in the future? I’m not sure, maybe. I’ve been using it a bit in the US the last few days. 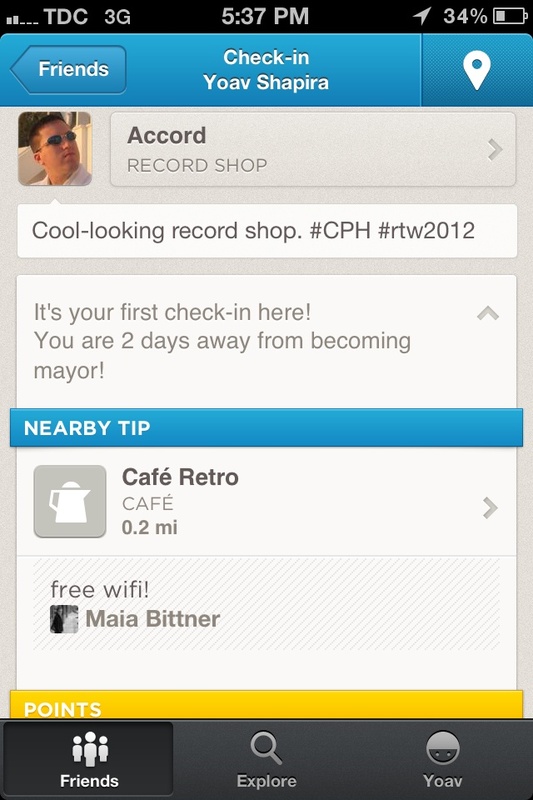 Should I have used Foursquare Places instead? Yes and no. I’d kind of like to have that same data in the Facebook social graph, accessible via API, visible on my timeline as a first-class citizen, and benefitting from future Facebook features. But I didn’t want to check Facebook during my trip, and Facebook Places doesn’t have the very useful Lists features, not to mention valuable tips / comments from friends and strangers for each place.